I've just purchased a laptop (without a cd-drive) and wanted to install Office. As a student I have free access to Office 2007 (Microsoft Office Suite 2007 Service Pack 1 32-bit (English) - MSDNAA). I'm currently using Office Starter 2010. 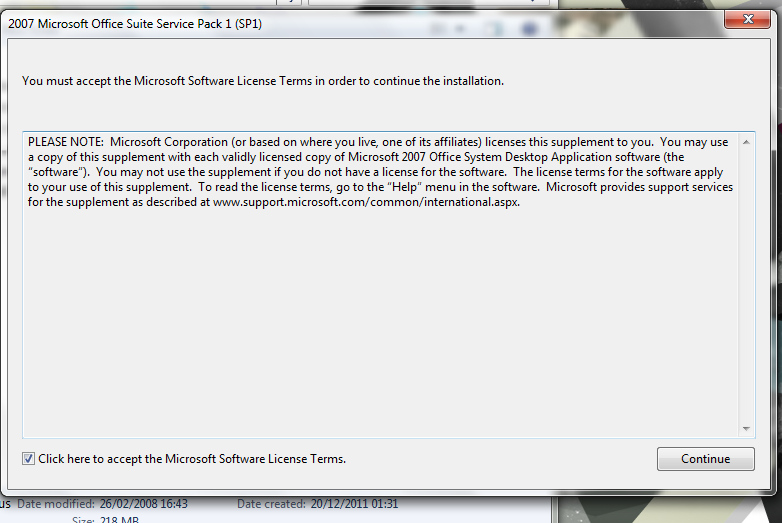 This is then followed by the message: "There are no products affected by this package installed on this system". I've looked online for a starter version of Office 07 (or something like that) to no avail. I've also attempted to "burn" the iso to a usb stick and install it that way but again with no success. I'd be grateful for some help as I have no idea of where to go from here. What you are trying to install is just the service pack, that's why you are getting that message. That sounds very correct to me. (I was in the full newb class back then). The OS's are the best thing on there. of 32 and 64 bit versions - saved a lot!! Grr I was hoping not to have to pay for it. My last laptop was a refurb and came with it for free. Thanks for the replies. Newbie with Windows 7 Home Premium x64, trying to install a fresh(new( Office Standard 2007. I get these cannot find errors. Help, don't know what is wrong with this new desktop as I've loaded OS 2007 on another laptop 3 months ago. I have Office 2007 installed on Win 7 Home Premium x64, but have never heard of that error. Is this a home built PC? What type of Windows and Office disks are you using? Store bought? OEM? Retail? Burned download? The decktop pc is brand new Acer (TigerDirect). I came with Windows 7 Home Premium installed. I am trying to install my legal Office Standard 2007 on it. There is no other (trial) or otherwise Office installed on the HD.